This information is a general guide. Make sure you read the instructions that came with your mask, as each model is slightly different and has specific instructions. You will also find helpful hints and guidelines on the manufacturer's website. Unclip the mask on one side only, (usually the lower clip only). Put the mask on your face, placing it on your chin and rolling it on to your nose. While holding the mask in place, secure the strap clip. Generally, the straps go above and below your ear. The mask should now be sealed. Check that it's not leaking by turning the machine on and feeling around the seal. Some air will escape from the exhalation holes. This is meant to happen. Don't ever tape over the exhalation holes. If air is leaking around the seal, you may need to adjust the Velcro straps to tighten the seal. The mask should be firm but not overly tight. If you have adjusted the Velcro straps and the mask is still leaking, take it off and follow steps 1 to 5 again. To take the mask off, do not undo the Velcro straps. Simply unclip the mask from the lower strap, on one side only. 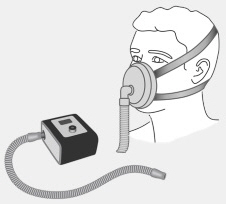 Place the mask over your nose, ensure the head gear straps are straight and positioned above and below your ears. Clip the mask into position. The mask should be sitting comfortably, with good clearance from your eyes and mouth. Turn the machine on and test for an air leak. You may need to adjust the Velcro straps – they should be firm, but not overly tight. If there is a leak, go through steps 1 to 4 again. 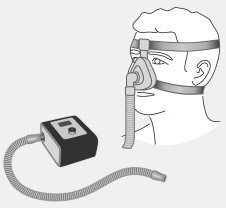 Information from Self-directed Learning Package for Ongoing Management of CPAP Therapy. Adapted by HealthInfo clinical advisers. Endorsed by clinical director, Sleep Unit, Canterbury DHB. Last reviewed June 2016.